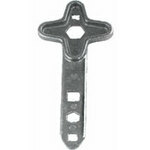 The Altman Multi-Purpose Stage Wrench is a useful tool in the studio or theater. It is made of die-cast aluminum, and features many common rectangular and hex-nut sizes. Use it to tighten or loosen stubborn, or hard-to-get-to fixtures. The four-star end also allows adjustment of those rusty old fixtures that have no side handles.